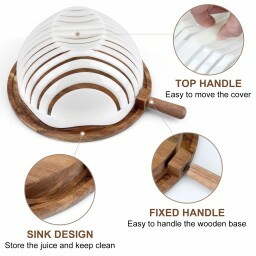 ☼ Wooden Base: The latest design concept of the salad cutter bowl, with a wooden base, is healthy and environmentally friendly. 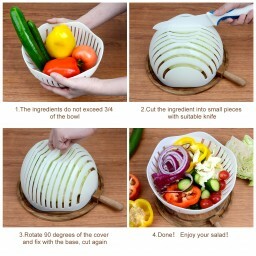 Compared to other plastic base salad bowls, it reduces the inconvenience of sliding and it also acts as a cutting board. Helps you reduce the waste of food material and the possibility of danger, so that you can fully enjoy the delicious salads. 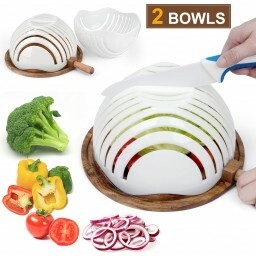 ☼ Double Salad Bowl: ESEOE salad bowl, equipped with two bowls, and has a higher capacity of 9.4*5.1inch, which can meet the food consumption of 4-5 people. This means you can enjoy salad with your family or friends. ☼ SIMPLE AND FAST: The method of operation is very simple. You only need to put your ingredients in the salad bowl, then place them on the wooden base, cut them with a knife, then rotate them 180 degrees, and then cut them again. Allows you to make delicious salads in 60 seconds! 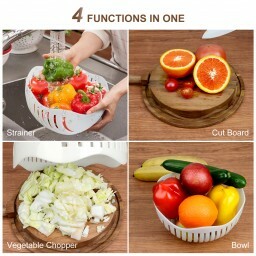 ☼ 4 FUNCTIONS IN 1: ESEOE Salad Bowl is a combination of 4 functions, it can be used as a strainer, cut board, vegetable chopper, salad bowl. Not only can it effectively help you solve the problem of cutting the salad separately, but it also prevents you from cutting your fingers. This way you can enjoy different fresh salads every day and maintain a balanced diet.